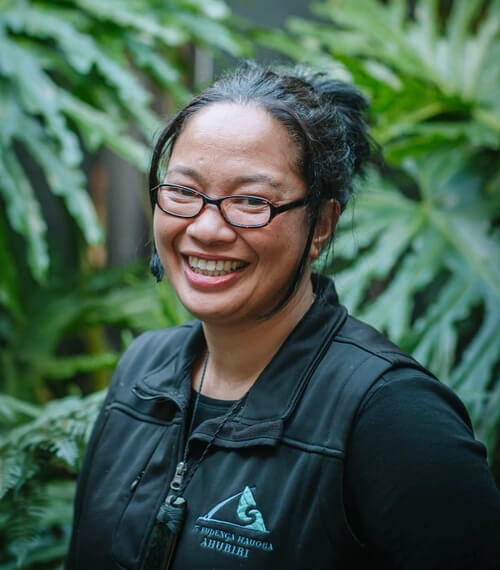 Hailing from the Waikato region, Hinerangi (Ngāti Hinerangi) works with school children as a Social Worker in Schools. Encouraging creativity and active engagement with school children are important drivers for Hinerangi's role. For her work in schools, Hinerangi’s lived principles reflect the protection of whānau, particularly the ‘rito’ (symbolic of a ‘child’ in the harakeke [flax fibre plant] metaphor) as the new generation for the survival of our family groups. Beyond her workplace she appreciates quality time spent with friends and whānau as well as tertiary study, sports training, and music. Hinerangi is most proud of being a Mum to all her children and doing this to the best of her ability gives her a great sense of achievement. Hinerangi has graduated with a Bachelor of Māori Laws & Philosophy (Poutuarongo Ahunga Tīkanga) and is currently studying towards a Bachelor of Social Work (Poutuarongo Toiora Whānau).